The Common Coral Snake is one of two species of coral snakes occurring in the United States and of more than 40 species found in Latin America. The North American species – but not the many Latin American ones – may be recognized by the black nose. All are related to the cobras and produce very small quantities of a highly potent venom that leads to respiratory and cardiac arrest. 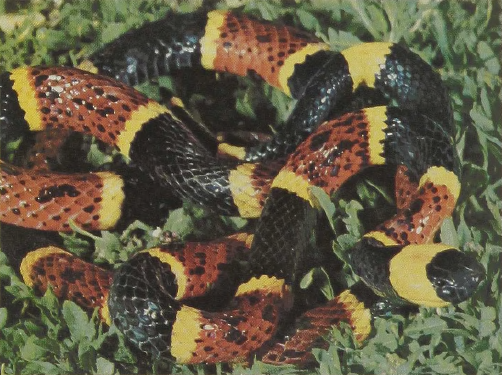 A whole variety of unrelated snakes, some rear-fanged and mildly poisonous and others harmless, show a similar banding in various combinations of red, white-yellow, and black. These banded snakes, averaging between 2 and 3 feet, occur throughout the Americas, where most of their small prey either avoid coral snakes altogether or treat any snake so marked with caution. Coral snakes themselves mainly live in hidden sites foraging on the forest floor or go down tunnels after burrowing lizards, small snakes, and amphisbaenians. Most bites in the United States occur when someone foolishly picks up the “pretty” snake.